You can download the PDF version of the Veseli family's life story here. Vesel and Fatima Veseli and their four children were a Muslim family living in the mountainous regions of Albania, in a village called Kruja during World War Two. Albania is a predominantly Muslim country, and was one of the first countries to be invaded during World War Two by Germany’s ally, Italy in 1939. Italy occupied the country until 1943, when Germany invaded. These occupations were resisted by Communist movements, who formed partisan groups to attempt to liberate the country. In 1942 the Nazis held the Wansee Conference, at which they planned the logistics of what they called ‘The Final Solution’ – the genocide of Europe’s Jews. At this meeting, lists were drawn up of how many Jews lived in each country in Europe. 200 Jews were recorded in Albania – a tiny percentage of the total population of 1,850,000. However, the Nazis were not aware that in addition more than 1,000 Jews had already fled to Albania from surrounding countries, in their attempt to emigrate out of Europe, and away from danger. Amongst these Jewish refugees were Moshe and Gabriela Mandil and their young children Gavra and Irena. The Mandils had fled Yugoslavia when the Germans invaded in April 1941, and were in Albania’s capital city, Tirana by 1942. In Yugoslavia, Moshe had owned a successful photography shop. When he arrived in Tirana, he contacted one of his former apprentices, Neshad Prizerini, who ran a photography store in the city. Neshad immediately offered Moshe work, and a place to stay for the whole family. Also working in the shop was a 17-year-old apprentice, called Refik Veseli. He had been sent by his parents to learn the photographic trade. In 1943, after a year of working together, Refik realised the Mandils were in trouble. Increasing numbers of German troops were arriving in Albania, and the danger for the Jews living there was increasing. Refik suggested that the family move to his parents’ home in the mountains, where they could hide. He travelled home and had a meeting with his parents and siblings. Refik’s father Vesel came to Tirana with some donkeys, and picked up the Mandil family. He told them they would travel on the donkeys to Kruja, but for safety they were only going to travel at night, avoiding main roads and busy areas. The journey took several nights, travelling over hazardous rocky terrain. During the days they hid in caves to avoid detection by the German military. When they arrived in Kruja, Moshe and Gabriela were hidden by the Veselis in a room above the barn, without their children. A large group of children lived in the village, from local families, and the children of hired help. The Veselis dressed the Mandil children as Muslim villagers which meant they could join this group and move freely around the village, without being questioned. Shortly after the Mandil family’s arrival, Refik’s brother Xhemal (pronounced Jeh-Mahl) brought another Jewish family who needed somewhere to hide - Ruzhica and Yosef Ben Yosef, and his sister Finica. Hiding two families was a big undertaking, but the Veseli family didn’t question their duty to do their best to offer protection. None of the neighbours in Kruja were aware that the Veseli family were hiding Jews in their home. In November 1944, there was a battle in Kruja between the partisans and the German troops, which ended with Kruja being liberated from German control. Moshe and Gabriela Mandil were so happy, they believed the danger was over. They left the Veseli house for the first time in over a year, and went down to the town square with the Veseli family. Their neighbours were shocked, asking who these people were. Moshe proudly proclaimed ‘We are Jews!’, and Vesel and Fatima were congratulated by their neighbours for saving the Mandil family. But the war was not over. The Germans attacked the village again, and all the Jews went back into hiding. Kruja was recaptured by the Germans, and the Jewish families feared that they would be found, or given up by one of the neighbours. Moshe and Gabriela told their children to leave the house and go and hide. That night the German soldiers went from door to door, searching for partisan rebels. When the children returned to the Veseli house 24 hours later, to their surprise they found their parents still there, exactly as they had left them. The Veseli house had been damaged by bombs. The Veselis hid inside with both Jewish families, and they all stayed completely silent in the dark. The Germans thought the house was abandoned, and didn’t search it. None of the villagers gave up the Jewish families to the soldiers. Anyone from the village could have benefitted from cooperating with the Nazi soldiers, and the Veseli’s efforts to hide and rescue the families would have been for nought. Many Jews who made their way to Albania were welcomed and sheltered in this way. The Albanian population were so effective in their efforts that there were only two reported cases of Jews being deported by the Nazis. In the Muslim holy book, the Quran, it says ‘Whoever saves one life, saves all of mankind’. The Albanians’ refusal to comply with the Nazis’ genocidal policies was grounded in ‘Besa’, a code of national honour, emerging from strong Muslim and ethical beliefs. Besa literally means ‘to keep the promise’. Both hidden families survived the war, thanks to the courage and generosity of the Veselis and their neighbours. The Mandils moved back to Yugoslavia, and Refik was invited to live with them to continue his photography training. The Veseli and Mandil families remained in contact for the rest of their lives. 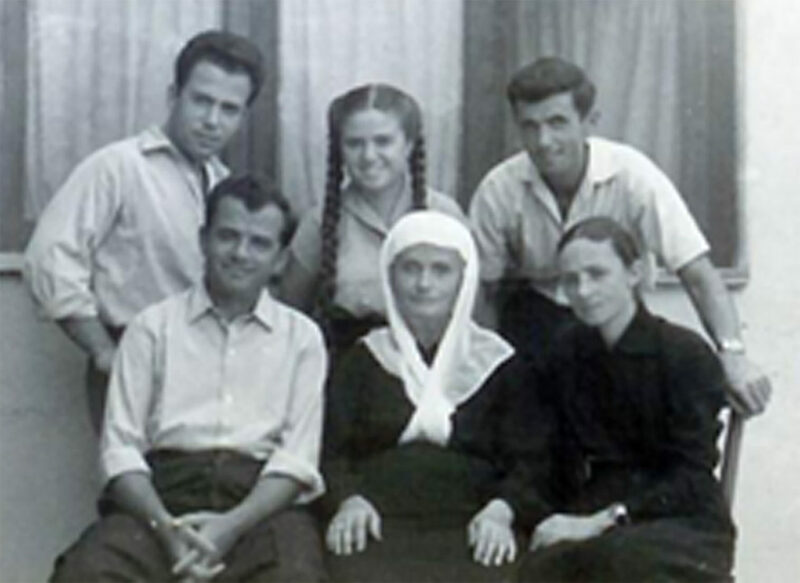 In 1987, Gavra Mandil wrote to Yad Vashem, The World Holocaust Remembrance Centre in Israel, and the Veseli family were named as ‘Righteous Among the Nations’ – a prestigious award for non-Jewish people who saved Jews during the Holocaust. This story is produced in partnership with Faith Matters. You can learn more about Muslim rescuers on the Faith Matters website - see The Role of Righteous Muslims. You can read more and hear Gavra Mandil’s testimony on the Yad Vashem website.